Ahmedabad, January 23: Citing to various projects planned amid the Vibrant Gujarat Global Summit 2019, state chief minister Vijay Rupani on Tuesday said that his government expects to see projects worth Rs 1.11 trillion to be either commissioned or initiated by end of current fiscal 2018-19. By March 31, 2019, the state government plans to ensure that projects, for which memorandums of understanding (MoUs) were signed in the recent VGGS 2019, would either commission or progress in terms of ground-breaking ceremonies or other ways of implementation. 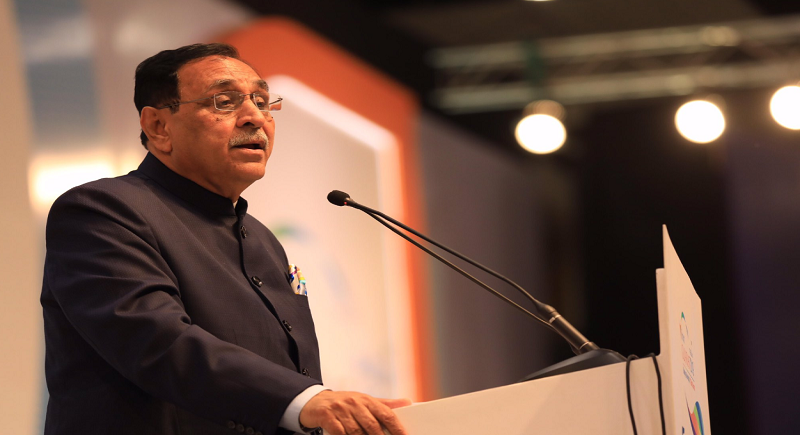 “The government had identified close to 400 companies which had signed such MoUs in the recently concluded summit”, said Rupani. "For this, we will constantly follow-up to facilitate these companies so that they are able to execute projects in the state. Some projects which were committed during previous summits are also reaching the commissioning stage and would be inaugurated by end of March 2019," he added further. These varied projects include industrial parks, conventional and renewable power projects, liquified petroleum gas (LPG) terminal, stainless steel plant, tyre and aluminium plants from the likes of Mahindra, Torrent, Shapoorji Pallonji, Chromeni steels, MRF and GACL-NALCO, among others, reported the statement. Rupani further stated that while the initial data could not be ascertained, these identified projects would result in employment generation for hundreds of thousands. Earlier, during the valedictory ceremony of VGGS 2019 on Sunday, Gujarat deputy chief minister Nitin Patel had asserted that around 2.1 million jobs would be generated through 28360 MoUs signed during the summit. Countering the criticism around project implementation as raised in the past by opposition led by Congress, Rupani said, "Critics of VGGS are unable to understand the processes required to be completed after the conclusion of such summits. The industrial projects cannot be expected to be commissioned overnight as they would require gestation period to reach at commissioning stage”. Meanwhile, quoting CRISIL report, state chief secretary J N Singh said that Gujarat topped in GSDP growth compared to other states from year 2013 to 2017 with 9.9 per cent. "During the same period, consumer price index-based inflation remained as low as 6.6 per cent and during 2018 it was 2.6 per cent," he said.